Do you feel like you often waste time just searching for emails in Outlook? Did you know that Microsoft understands this pain-point, and created a solution to help? They’re called Search Folders, and by using them, you can greatly reduce the amount of time it takes to locate emails. 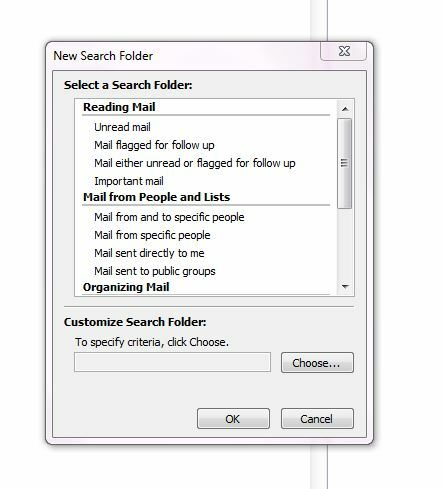 Search Folders are virtual folders that you setup in Outlook, which gives you all email items that match a certain pre-defined criteria. 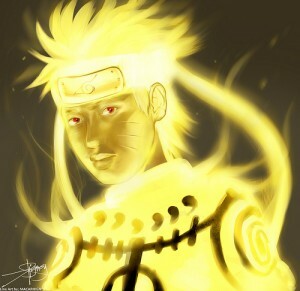 You will typically find them located at the bottom of your Folder List in Outlook, under the RSS feed. Just look for Search Folders in your Folder list. There are probably a few Search Folders already setup, even if you aren’t using them. 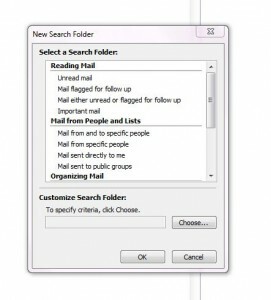 By default, Outlook comes with three Search Folders: Categorized Mail, Large Mail, and Unread Mail. Categorized Mail – This Search Folder will display only those email items categorized by Color Category. In order for this predefined search to work, you will have to change the criteria to the Color Category you are using. To change the criteria, right click on the Categorized Mail folder, click on Customize This Search Folder, click the Criteria button, and define the colors you are using for categorization. Large Mail – Includes all email items larger than 100 KB. Unread Mail – Includes all email items that are marked as unread. However, just because these are the default folders doesn’t mean you need to use them this way. Feel free to create your own folders with the criteria of your choosing. To create new Search Folders, either: a) Right click Search Folders, and click on New Search Folder OR b) Click on Folder on the Ribbon at the top, and then click on New Search Folder. The New Search Folder screen will appear. Microsoft has compiled a list of common uses for Search Folders. Select your use from the list. If nothing in the list matches your needs, scroll to the bottom and click on “Create a Custom Search Folder.” Input / verify your specific criteria, then click okay. When the Search Folder is created, it automatically begins processing the request. Depending on the size of the search and your volume of email, it may take a moment or two to process. That’s all it takes to setup Search Folders. Once setup correctly and in place, you should find that the amount of time it takes you to search your emails is greatly reduced. And, if you later find that you spend lots of time searching for something else, you can always setup another Search Folder. What do you use Search Folders for? Leave us a comment telling us about it. Julie Strier is a freelance writer who wants to help you be more productive with your email and Outlook. Email: julie@mybusinesswriter.com. Website:www.mybusinesswriter.com. Last time your computer died, what did you do with it? Did you use it for parts? Did you recycle it? Or did you just throw it away with the rest of the household trash. If you just threw it away, you may want to reconsider your actions the next time you are placed in a similar situation. Each year in the U.S. alone, over 50 million computers are disposed. Not recycled, not reused, but thrown, ultimately, into a landfill. The problem is that computers (and other electronics) are full of all sorts of heavy metals and chemicals which can leech into the earth. In fact, several regions of Asia are reporting high levels of lead pollution because of the large levels of electronic scrap in those areas. That’s because the U.S. (and several other countries), routinely export broken and scrap electronics to other countries, so that cheap labor can be used to process out any usable parts and valuable metals for reselling. Anything unusable ends up in the soil, polluting the earth and causing health problems for the residents. Next time you’re faced with a dead computer, try one of these solutions instead of the trash. Typically when a computer “dies” the whole thing isn’t unusable, just certain key components. Rather than trash the entire thing, why not see if you have a use for the parts. If your hard drive still works, put it in your new computer, or use it as a backup drive. If you’re technically inclined, and your computer is new enough, you could use the working parts to lower the cost of building your new system. Also remember that just because your computer died, doesn’t mean you have to get rid of everything. If your keyboard, mouse, speakers, and other peripherals still work then there is no need to get rid of them. Keep in mind that your ability to reuse your parts will depend on their age. If your computer is more than three or four years old, you are probably better off recycling it. There are many recycling centers and programs setup to help people properly recycle their computers. Using one of these centers or programs ensures that your computer doesn’t end up in a landfill, harming the environment. Here are some resources for next time you need to recycle electronics. Did you do something aside from reusing or recycling last time your computer died? Leave us a comment and tell us what you did. 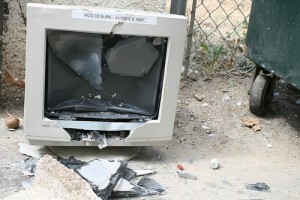 Julie Strier is a freelance writer who wants to help you dispose of your technology properly. Email: julie@mybusinesswriter.com. Website:www.mybusinesswriter.com.